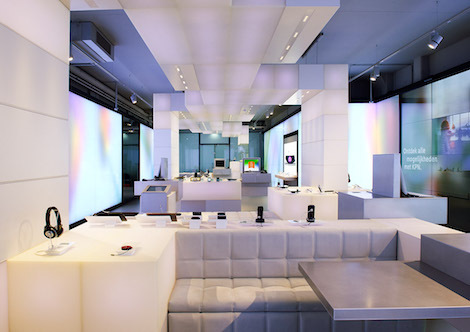 Scala Inc. tells us that its digital signage technology is playing a key role in KPN’s brand new in-store experience, allowing customers to explore the store as if they were physically inside the KPN website, putting discovery and testing at the centre of the customer experience. Leading Dutch telecommunications and ICT service provider KPN worked with local systems integrator QYN to develop and bring the concept to life, rolling out Scala’s digital signage technology, including Scala Content Manager and Player. Scala’s digital signage technology supports a wider multichannel store pilot formula, built around islands of products connected to ‘smart’ 2×4 large format interactive video walls, RFID, electronic price labels (ESLs) and sophisticated queue management, while also integrating other customer contact points such as online shopping and customer contact centres. 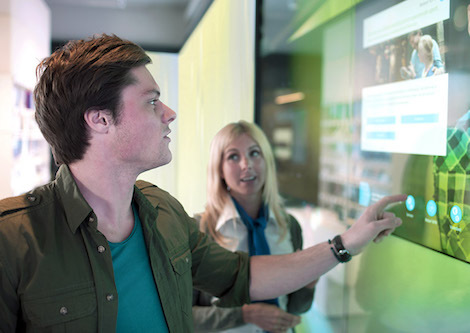 KPN’s ‘store of the future’ pilot is a sophisticated IT and communications project that also includes audio technology, smart wall controls and other IT systems including climate control, all designed to maximize every aspect of contact with the customer. KPN is a leading supplier of telecom and IT service and serves a large number of diverse customer groups at home and abroad with a wide range of products and services under various brands; from prepaid call services in the USA to interactive HD television in the Netherlands. QYN specializes in the integration of media technology in the field of Digital Signage and in-store interaction. QYN powers over 10,000 screens across the Benelux area. This entry was posted on Tuesday, July 4th, 2017 at 13:54 @621 and is filed under DailyDOOH Update. You can follow any responses to this entry through the RSS 2.0 feed. You can leave a response, or trackback from your own site.